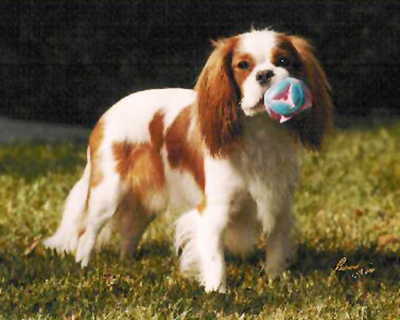 Brighton finished his AKC Championship The Del Valle Kennel Club of Livermore in March 2000 under respected Judge Mr. Don Sutton. Brighton was the all American jock. He was energetic and would most likely greet you with a ball if you came to visit. He was quite sure that you came with the sole purpose of visiting and playing with him. He was a sweet and even-tempered boy. 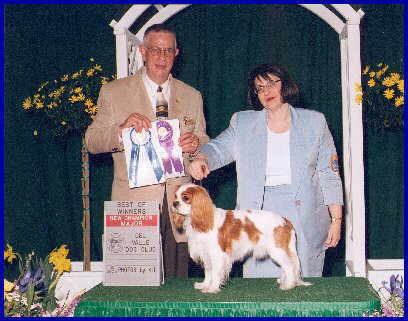 Brighton was the son of AKC/CKC CH Mostyn Celtic Sorin, a Multiple Toy Group and Best in Show Winner and the top ranked Cavalier in Canada in 1998.